Mason Cash Perfect Pie range has been complemented by a series of accessories to help make and bake the perfect pastry. The stoneware black pie bird adds a touch of fun and functionality by allowing the steam to escape from the pies in a final bake and to prevent your pie from bubbling over and soggy. 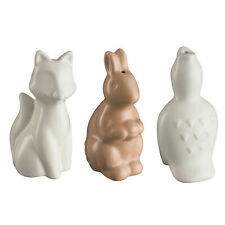 This unmarked pottery pie funnel is in the novel shape of a rabbit with long ears, it has been hand painted. Condition as shown; staining and a small hairline. Approx 3" in height. are not negotiable. Greek Chef Pie Funnel. Each pie funnel made by Stuart Bass is hand painted so no two are alike making them very collectable. He is very well known for his eclectic and highly collectable pie funnels and is considered as the master of all pie bird makers. Vintage Nutbrown Pie Funnel White Elephant . Condition is Used. Made of china. No chips or cracks. Measures 8 cm tall. Tg Greens pair of Blackbird Pie Funnels. Condition is Used. 2 sizes. They do not have any boxes. Beautiful pair that have obviously well loved. Not perfect but still really cute. Oddball Gloria Pie Funnel (2003). Each pie funnel made by Stuart Bass is hand painted so no two are alike making them very collectable. He is very well known for his eclectic and highly collectable pie funnels and is considered as the master of all pie bird makers. Each pie funnel made by Stuart Bass is hand painted so no two are alike making them very collectable. He is very well known for his eclectic and highly collectable pie funnels and is considered as the master of all pie bird makers. 'Chef in a Pie' Pie Funnel. Each pie funnel made by Stuart Bass is hand painted so no two are alike making them very collectable. He is very well known for his eclectic and highly collectable pie funnels and is considered as the master of all pie bird makers. Opera Singer Pie Funnel. Each pie funnel made by Stuart Bass is hand painted so no two are alike making them very collectable. He is very well known for his eclectic and highly collectable pie funnels and is considered as the master of all pie bird makers. Vintage Pie Bird Funnel in the form of a Goose / Duck Head. 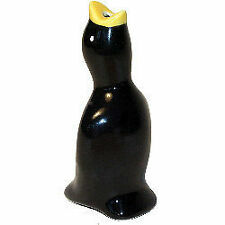 You are bidding on this lovely vintage pie funnel in the form of a duck or goose head. 4.25" in height. Condition is vintage undamaged. Dispatched with Royal Mail 2nd Class. Black with yellow beak. Approx 10.5 cm tall. Collecting STUART BASS PIE FUNNELS. by JUNE TYLER. China PIE FUNNEL. Marked inside "ROYAL WORCESTER ENGLAND". These three Pie Funnels have different height "shoulders" to support the pastry lid of the pie, either 3 cm, 4 cm or 6 cm above the base of the pie. Each pie funnel made by Stuart Bass is hand painted so no two are alike making them very collectable. Bull Pie Funnel. He is very well known for his eclectic and highly collectable pie funnels and is considered as the master of all pie bird makers. Pig Chef Pie Funnel. Each pie funnel made by Stuart Bass is hand painted so no two are alike making them very collectable. He is very well known for his eclectic and highly collectable pie funnels and is considered as the master of all pie bird makers. Microwave, dishwasher and oven safe . 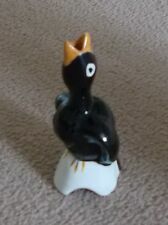 Made in the 1960s, I am told, by New Devon Pottery, their "Sunglow" pie bird. Spillers sold these i think in the 70s. "GRADED GRAINS MAKE FINES FLOUR". IDEAL FOR A FRED PIE COLLECTOR OR A VERY GOOD GIFT ie christmas. Wine Waiter Pie Funnel (2012). Each pie funnel made by Stuart Bass is hand painted so no two are alike making them very collectable. He is very well known for his eclectic and highly collectable pie funnels and is considered as the master of all pie bird makers. 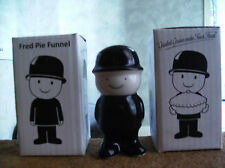 Oddball Zoe Pie Funnel (2003). Each pie funnel made by Stuart Bass is hand painted so no two are alike making them very collectable. He is very well known for his eclectic and highly collectable pie funnels and is considered as the master of all pie bird makers. 2 x Vintage Black Bird Funnels Piebird One On A Branch And 1 x Secla. Condition for bird on a branch is very good vintage used, no chips minor manufacturing flaw or hairline to base. Secla has some staining to base and what looks to be an air bubble not a chip. Dispatched with Royal Mail Signed For £5. Vintage Clarice Cliff pie funnel from the 1930s. Blackbird vent for cooking pies. Backstamp: Made in England. Lovely genuine old piece. Very collectable. No crazing or chips. Newport Pottery. On the front white area, there is the faintest sign of an impression - possibly a number. But it is not possible to make it out. Free collection from London N11 Thank you for looking. Please see my other items. By Ebbies Angela Rogers. I run out of adjectives to describe Angela Roger's Work. Rare and Collectable Pie Bird. The Bird Speaks for itself. Limited Edition No. 6 Jan 9 2004. Beautifully Hand Crafted by a very Gifted and Unusual Artist. An ti qu e vi nt ag e pi e fu nn el. I h av e ne ve r us ed i t, s o co nd it io n is e xc el le nt. I t ha ve s om e go ld o n a creamyw hi te b as e.
Steve Woodhead is one of the leading potters in the country and is a Fellow of the Craft Potters Association. He has been making pots for over 25 years. Most of his pots are made on the potter’s wheel. EARLY NUTBROWN ELEPHANT PIE FUNNEL - EARLY ORIGINAL. A lovely example in very good condition. The funnel has a single spot of underglaze marking which looks like a tiny run ink mark (see pictures for this). IT'S A GREAT ITEM THAT WILL ENHANCE ANY GOOD PIE FUNNEL COLLECTION. NOT MARKED BY THE MAKER BUT ORIGINAL BOX SAYS CREICAU POTTERY. IT'S A GREAT ITEM THAT WILL ENHANCE ANY GOOD PIE FUNNEL COLLECTION. Vintage Gourmet Pie Cup / Funnel / Vent - Kitchenalia - Great! Swan Brand British Made 2nd world war utility aluminium ? Metal pie funnel . Size approx. 2.4 inches ( 6 cms ) tall Good condition some scratches from age & use...,see pics. 1ST BATCH WITH Reg No 809138 ON FRONT DATEING THIS TO THE 1930s. CLARICE CLIFF. NEWPORT POTTERY. CONTENTS AS SHOWN IN MY PICTURES. This sale is for an old 2 piece pie funnel by Royal Worcester, in very good condition. NOS Vtg Pie Bird Air Vent Ceramic Porcelain Brown Black Yellow Baking Tool 3"